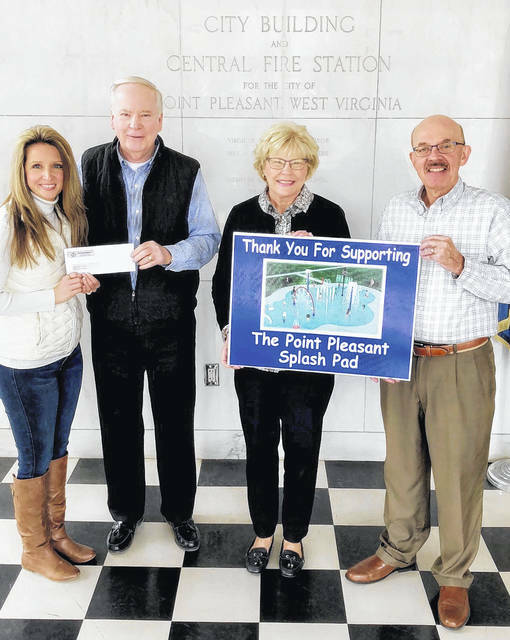 The McMillan family, along with Mid-Atlantic Construction, recently purchased the “water rainbow” component for the Point Pleasant Splash Pad. Pictured from left are City Clerk Amber Tatterson, Bob and Becky McMillan and Mayor Brian Billings. The city hopes to break ground on the splash pad at Krodel Park this year. https://www.mydailytribune.com/wp-content/uploads/sites/42/2018/03/web1_3.29-Splash.jpegThe McMillan family, along with Mid-Atlantic Construction, recently purchased the “water rainbow” component for the Point Pleasant Splash Pad. Pictured from left are City Clerk Amber Tatterson, Bob and Becky McMillan and Mayor Brian Billings. The city hopes to break ground on the splash pad at Krodel Park this year.